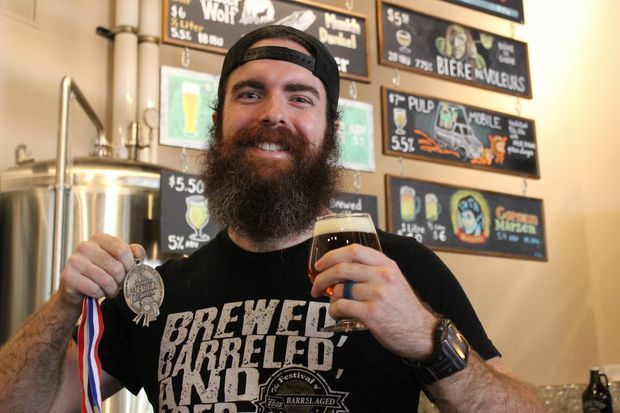 Matt Johnsen holds a silver medal he took home from the Great American Beer Festival Oct. 7. The brewer helped create Biere de Voleurs, which was awarded second place in a category for French- and Belgian-style ales. BEVERLY — Horse Thief Hollow's newest beer medal will hang in the Beverly brewery as it hosts a viewing party at 10 p.m. Sunday for its segment on "Chicago's Best." The episode will highlight the area's best brewpubs and will showcase a long-standing menu item, according to Neil Byers, who owns the establishment at 10426 S. Western Ave.
Byers wouldn't reveal the specific item that will be featured as part of the show but hinted he brought in a friend and mentor to help him with the cooking, which was filmed Sept. 25. In the meantime, Horse Thief Hollow won a silver medal Oct. 7 at the Great American Beer Festival, according to Matt Johnsen, who works as a brewer alongside Dave Williams on the South Side. "It was a huge adrenaline rush," Johnsen said of his reaction to hearing his brewery's name called at the festival in Denver. Horse Thief Hollow entered five of its beers in the annual competition. It's winning beer is called Biere de Voleurs — which translates to "beer of thieves," Johnsen said. Horse Thief Hollow actually attempted to brew the beer several years ago and returned to the recipe this year, tweaking it just a bit. Biere de Voleurs was one of 53 entries in the category of French- and Belgian-style ales. It was also the last category to be awarded, which had Johnsen and Williams worried they'd be going home empty handed. "Our wives said they were really getting worried because they didn't want to deal with us being bummed out all day," Johnsen said. 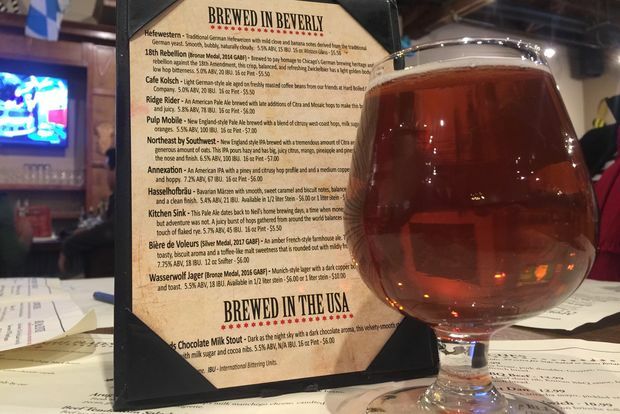 Byers said the award-winning beer isn't something that most customers immediately choose from his menu, as his patrons tend to look for lighter beers or IPAs. The winning farmhouse ale is described as having a "toasty, biscuit aroma and a toffee-like malt sweetness." "Once you dig into it that kind of beer, it is really good at this time of year," said Byers, who continues to work finalizing a wider distribution of his beer. He's hoping to have kegs available in the first quarter of 2018. • A bronze medal at the 2016 Great American Beer Festival for its Prunckle’s Dunkel, a dark German lager. • A first-place finish at the 2016 Festival of Barrel Aged Beers in the Classic Beer category for its Hilltop Weizenbock, a Bavarian wheat beer aged in Palo Santo wood barrels. • A silver medal at the 2014 World Beer Cup for its limited-edition Cheval Deux, a sweet potato infused French brown ale. • A bronze medal at the 2014 Great American Beer Festival for its 18th Rebellion in the Kellerbier or Zwickelbier category. This category celebrates “cellar beers,” a unique German style of unfiltered and unpasteurized lager that dates to the Middle Ages.